Are you surprised we’re posting event photos? Some of you may not even know that Radiant Photography does non-Wedding events because we don’t typically blog about them. Recently however, we’ve done some events that we’ve absolutely L-O-V-E-D and we thought you might too so we’re dying to show you the photos from them! …to Ricardo’s own glittering and glamming birthday party! Event #1: Open house at Greystone Mansion in Beverly Hills. 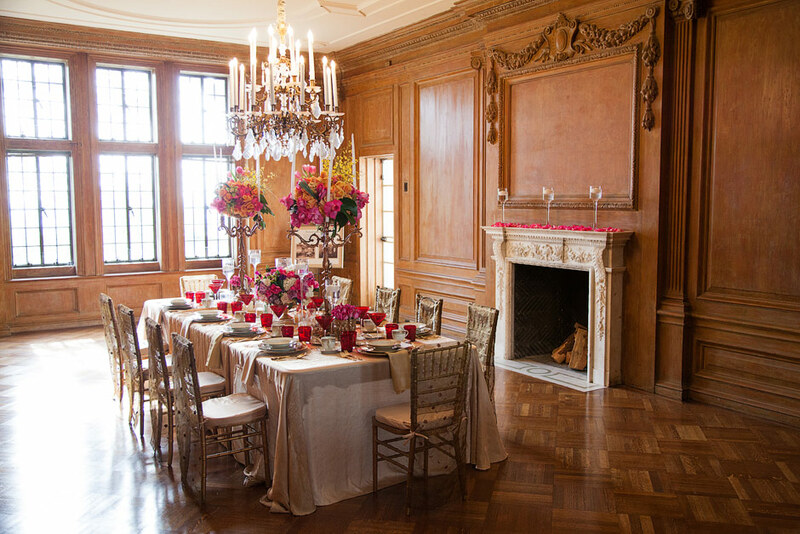 The first thing we partnered with Luna Gardens on was a luncheon to introduce the newly opened interior event space at the historic Greystone Mansion. Greystone is one of Beverly Hills’ oldest mansions and has been the set for many movies over the years (like Ghostbusters, The Bodyguard, Air Force One, The Big Lebowski, Spiderman, There Will Be Blood, The Social Network and so many more). Greystone has been available to rent for weddings and events for some time, but the outdoor space there was your only option… until now. 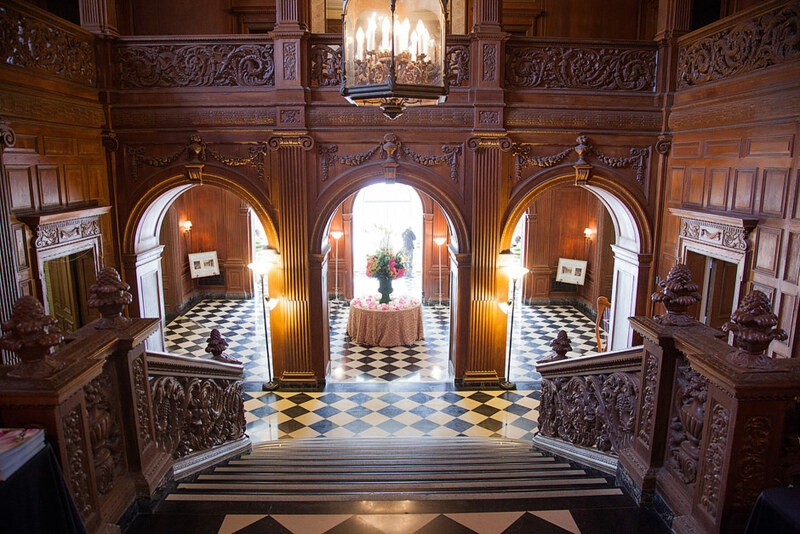 To announce their newly opened space to the public, Greystone invited some of Los Angeles’ premier event coordinators to see the interior while dining on some of their fabulous caterers’ dishes, including those of Wolfgang Puck! Luna Gardens played a major role in this event by setting up a mock dining table in one of the many elegant Greystone rooms in order to showcase what an event could look like in that space. 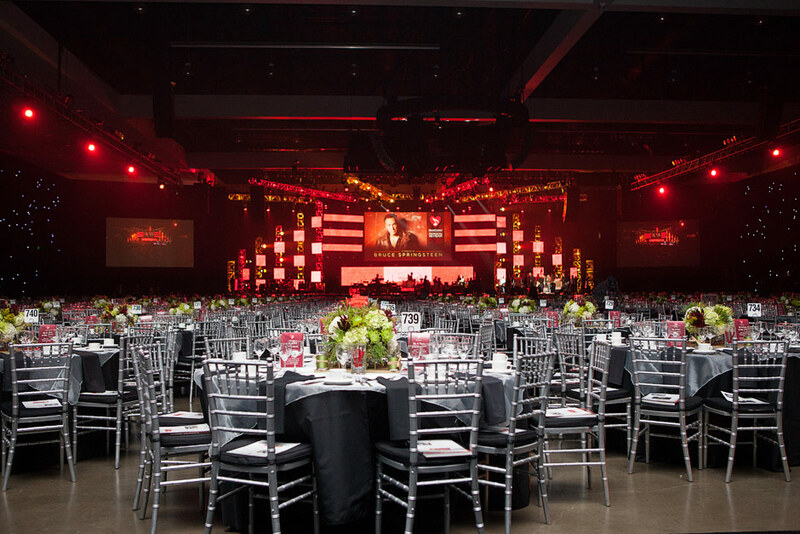 I’m so glad Ricardo was able to cast the vision for the space to the guests, because as is his typical elegant style, the room was beyond impressive with the gorgeous table that he had decked out in marvelousness. Good thing he thought to have us come to take pictures of his work that day because it would’ve been a shame for all that brilliance to go uncaptured! Event #2: A Grammy Foundation Gala. The second event we worked with Ricardo on, was one that was very near and dear to Scott and my hearts and that was the Grammy’s “MusiCares Person of the Year Gala” honoring Bruce Springsteen. The additional bonus to this (other than getting to hear private rehearsal performances by Sting, Faith Hill & Tim McGraw, Patti Smith, Tom Morello & Jim James, John Legend, and Neil Young) was that our other photography team, Josh and Kelley, got to be a part of this event with us! It was the weekend of our company retreat so they’d left the Phoenix AZ desert to join us in Los Angeles for a weekend of palm trees, sand, and a chance to stand a foot away from Sting while listening to John Legend perform! Not only was the entertainment during our shoot of the set up stellar, but it was quite an experience in itself to see Ricardo’s masterpiece at this event. He was responsible for all the table decor, as we’ll as furnishing and decorating the dressing room areas in the back. And as you can see, they definitely chose him for this important job for a reason! Event #3: Ricardo’s 25 x2 Birthday party at the Andaz West Hollywood Hotel. And finally, we ended our speedy stream of recent Luna Garden events with a party for the man himself! It was Ricardo’s 50th… excuse me, I mean “25 x 2″, birthday party!!!! After seeing the works of art Ricardo had done for others, we could only imagine what he could dream up when he was allowed to do every little thing he’d ever wanted to! So what came out of Ricardo’s creative freedom for his once in a lifetime 25X2 party?!?! Why GLITTER of course!!! This room was so diamond-esque blingy that it would’ve put Liz Taylor herself to shame! It was gorrrrrrgeous and definitely fulfilled my lifelong fantasy of what every room should ALWAYS look like forever! If there was a place for shine… it was shimmering. If there was a place that had a hint of matte, bling was immediately added. Everything from the reflective linens covering the walls to the mirrored dance floor… every aspect of the penthouse suite in the Andaz West Hollywood Boutique hotel that night was decked out to make everyone present stand up and take notice! Even Ricardo himself had a fabulous sheen to match the incredible decor! The guests all loved it of course and were so happy to watch the friend they love have the kind of real shining moment that was so incredibly fitting for him and that he really deserved. Congratulations Ricardo…. not just on hosting an incredible birthday party but for uncovering the incredible talent in yourself and finding ways to pursue it. Congratulations on working with such prestigious people, locations, and events, as well as on maintaining such a wonderful group of people who love you and can celebrate your success along with you. This post wouldn’t be complete without also thanking the wonderful Sarah Z from Sarah Z Events who not only is to thank for introducing us to Ricardo, but who is also the backbone to all these events we did with Luna Gardens and who helps do what it takes to pull them off! Thank you Sarah for being such a lovely person, who also does such a good job, and who we are always happy to see whenever your smiling face appears! We’ve loved working with you!!!! You can see more of Ricardo’s events on his Luna Gardens site and keep an eye out to see more of it on our site in the future as well! So this is going to be one of those rare blog post by me (Scottie). In fact the last time I wrote a blog about a wedding was when my good friends Gabe and Angela got married almost 3 years ago. Once again the nuptials of a close friend have broken my blog silence. I met Mikey about five years ago at a church college group. He would drive down to Scottsdale every Thursday night from Payson to hang out. Eventually Mikey made the move to Scottsdale where he moved in with Erik and Jay (the DJ and Videographer for the wedding) and the four of us formed a band. It was evident pretty quickly that Mikey was a musician on a completely different level than the rest of us. It was fun while it lasted but Mikey needed to spread his wings. He joined up with some amazing musicians and they formed a band called the Technicolors. These guys are freaking amazing and you have to listen to their music, here’s a link to my favorite song. The reason I tell you all of this is because it was while performing at a Technicolors concert that Mikey caught the eye of a beautiful Australian girl name Kristen. Her friends dared her to go get a picture with the cute guitar player with the big hair so she did. So after lots of facebooking, skyping and flying back and forth between the US and Australia they decided they wanted to spend the rest of their lives together. Here is how it went down. Look at that hair! First groom ever with a headband. My favorite part of the entire day was the amount of emotion that poured out from Mikey, Kristen, the friends and families and especially their moms. Both of the moms were there for every part of the day smiling, crying and cheering on their kids as they went through their wedding day. It was really inspiring. After the ceremony we braved some foreboding skies and few rain drops to take advantage of the beautiful Eagle Mountain Golf Club. We had so much fun. Apparently Australians take their dancing very seriously and they challenged all of the Americans at the reception to a dance off. Winners…You decide. For some reason all of Mikey’s friends thought that he needed a kiss on the cheek before he left the reception. Thank you Kristen and Mikey for allow me to be a part of such an amazing day. It was truly a blessing to be counted as one of your friends as we celebrated your new life together. Click to see the rest of the photos from Kristen and Mikey’s Wedding. denise nicolette - This was the most special wedding to have been blessed to be a part of ~ and these photos just captured this beyond amazing day… so, so perfectly!! What a gift you have Scott!!! I cannot even put in to words ~ to express how much I love these photos ~ how special this post is to me..and just how truly thankful I am to have had the opportunity to be able to work alongside such a high caliber photographer as yourself!! These photos are amazing~ Blessings!! KaLeena - Wow, I just saw him perform at the Crescent Ballroom on January 19th. What a small world! Congratulations! All of you Radiant fans have spoken… and you have been heard! The results of our “Best of 2012: Weddings and Unique Sessions” contest are in! Out of 80 photos in the album on Facebook, these are the photos that received the most votes (click here if you want to see all the runners up). So this first photo is most definitely NOT in random order because this one beat all the rest by a huge margin! So this amazing, beautiful, vineyard wedding ceremony is the ultimate first place winner of, “Best Radiant Wedding photo of 2012″!!! Congrats Ashley and JT! I’m especially excited about this win because JT was the wedding photographer for Scottie and my OWN wedding! See photos from our wedding as well as more from this gorgeous vineyard wedding, here! A 2012 Radiant bride who came to vote on her OWN wedding photos said, “even though this isn’t my wedding I LOVE this moment and photo so I have to vote on it”! See more from Ross and Megan’s wedding with a view. Words like “chaps”, “staches”, “Movember”, aren’t often associated with weddings… but voters DID use them for this photo! See more photos from Ashley and JT’s gorgeous vineyard wedding. Officially this photo wins because of the number of votes it had. But it wins in my (Breanna’s) heart because I actually had to translate one of the comments into English which I thought was awesome (FYI Facebook does that for you! )… and because the preacher called himself a hottie. See more from Clarence and Shanya’s very fun wedding. The voters were big fans of how the bright colors contrasted the rustic background on this photo. See more photos from Ashley and JT’s gorgeous vineyard wedding. The comments on this photo between family members, especially between the bride and her father, are so beautiful that you just have to go see them for yourself. See more of Ashlee and Jason’s Elegantly Rustic Wedding. This photo of the guys praying before the wedding was a photo Scottie knew he HAD to get since it’s a duplicate of one of his favorite photos that JT (the groom here) took when he was the photographer at our own wedding! See the photo from our wedding that this one is based on as well as more from Ashley and JT’s beautiful vineyard wedding, here! One voter declared this one “winner, winner, chicken dinner”. Looks like he knew what he was talking about! See more of Susanne and Greg’s Gorgeous Golf Course Wedding. It looks like voters can’t resist the kind of manly groomsmen photo that Scottie’s famous for, anymore than I can! See more of Amanda and AJ’s delightfully detailed wedding. It was said that this photo was a perfect capture of Ashley and JT’s personality. See more photos from Ashley and JT’s gorgeous vineyard wedding. Michelle, I’d like you to know that you were called a supermodel in this photo! See more of Michelle and Derek’s Creative Surprises wedding. This picture of these little girls and their great grandpa is one of my favorite photos we’ve EVER taken! See more of Amanda and AJ’s delightfully detailed wedding. As much as I’d like to think it’s my photo that won here, I think it’s Fawn’s dress that voters thought was the real winner. See more from Fawn and John’s vintage charm wedding. Capturing one of the many genuine emotions felt by all on this wedding day! See more of Melissa and Kevin’s emotional, vineyard wedding. What says America more than this?! See more from Fawn and John’s vintage charm wedding. I love that the grandmother of the bride who wore this dress told someone to cast a vote for her since she’s not on Facebook! See more of Amanda and AJ’s delightfully detailed wedding. The bride pointed out that this photo is extra special to her because one of her bridesmaids lives in Slovakia and she didn’t expect her to be able to make it. So the fact that she DID come and got to be in this picture is an amazing memory for the bride. See more of Christine and Marc’s perfect wedding day. I absolutely loved the bride’s comment on this one: “I love everything about this photo, it was shortly after the wedding and everything still felt like a dream. This is my dream come true captured in one photo. So blessed to be married to this guy and I’m so glad you guys captured the beauty of our day.” See more of Ashlee and Jason’s Elegantly Rustic Wedding. The bride tagged this photo as: #stillcan’tbelieveImarriedthemanofmydreams. See more of Melissa and Kevin’s emotional, vineyard wedding. Voters loved this bride’s sass as much as I (Breanna) do! See more of Christine and Marc’s perfect wedding day. Now THAT is what I call a view… and voters agreed with me! See more from Megan and Mark’s Marvelous Maui Wedding. Trailer trash wedding or just a really, really awesome wedding? Check out more from Fawn and John’s vintage charm wedding and you’ll have the answer! While one sentimental voter said they were walking off to live a beautiful life together, the groom clarified that he was just heading that way to see what was on the other side! See more of Melissa and Kevin’s emotional, vineyard wedding. Even though your vote could only count once on each photo, the bride loved this photo of her sweet groom and ring bearer so much that she found a way to like it 4 times! See more of Melissa and Kevin’s emotional, vineyard wedding. This was by far the voters’ favorite 2012 Radiant wedding location! See more of Marah and Shawn’s Elegant Wedding day. One voter said this photo “captured all the happiness of the day!” I agree, there’s a happiness explosion going on here! See more of Kim and Tru’s Genuine Wedding. Oh, is that the most beautiful field you’ve ever seen?! I’d hardly noticed it! See more from Megan and Mark’s breath taking Maui Unique Session! The incredible style at this wedding didn’t just come from tablecloths and centerpieces… the people themselves maintained an unstoppable cool factor! See more from Fawn and John’s vintage charm wedding. Oh, is THIS why people like going to Hawaii to get married?! I think yes. See more from Megan and Mark’s breath taking Maui Unique Session! His mom thinks he’s a winner (as do many others apparently!). See more from Fawn and John’s vintage charm wedding. Chillin’ out, maxin’, relaxin’ all cool. See more from Fawn and John’s vintage charm wedding. I love our more classy and astute voters, like the guy who pointed out that “this guy is f’ing happy”. Haha I love it. See more from Clarence and Shanya’s very fun wedding. One voter loves this photo so much that she’s extremely proud that her very own shoulder made it into such a masterpiece! See more of Melissa and Kevin’s emotional, vineyard wedding. We have some nature fans out there who LOVED the background of this wedding! See more of Jen and Kenyon’s Countrified Fairytale Wedding. Black and white wins every time! See more of Susanne and Greg’s Gorgeous Golf Course Wedding. Congratulations to all of the couples in our winning photos. Your win is a testament to you putting a lot of hard work, thought, and time into your photos and to you planning amazing weddings and Unique Sessions… thanks for making our portfolio amazing! We can honestly say we love you all and we feel so blessed that we get some of the best couples around. 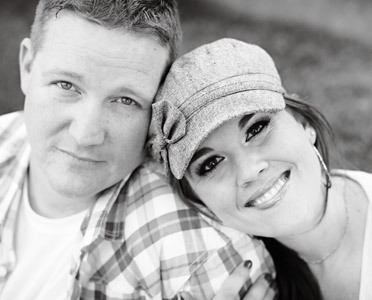 We regularly get comments on our Facebook page and blog telling us how cool our couples are… and we SO agree! Thanks so much to everyone who voted. We had so much fun reading all the comments and you were all a major encouragement to us (see the nominee photos and the voting comments here). Thanks to all your kind words we’re all refreshed and psyched out of our minds to blow it up in 2013! Here’s to a fantastic 2013!